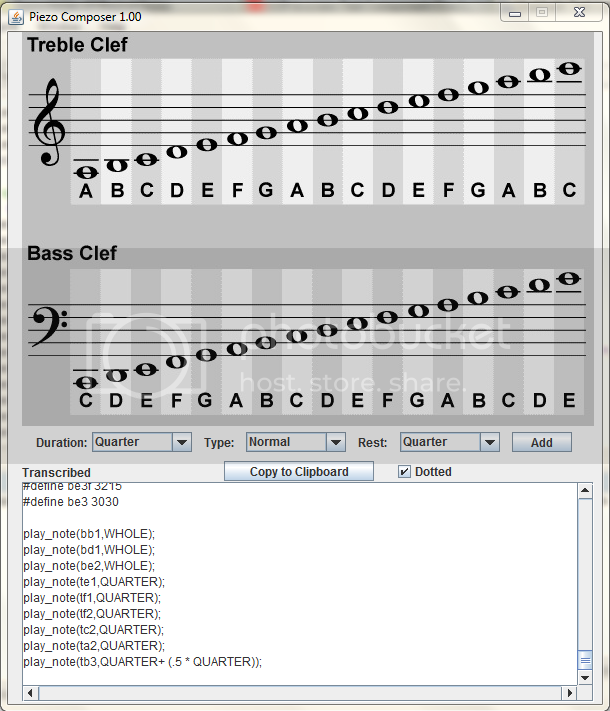 So I was tinkering with making music with an MCU, and I realized one thing: I hate transcribing sheet music into code. I wanted to make it simpler for my self. I figured I could make a simple app where I could click on the note I wanted without having to refer to a guide as to which note was what and then figuring out how I would do it in code, etc. function that takes the period of a note in microseconds, and the duration that note is to be played in milliseconds. After that, set the duration of the note (Whole, Quarter, Eighth, etc. ), if it is flat,sharp, or normal, and check the checkbox if it has a dot next to it. Then simply click the note on the staff and watch the magic happen! After you are done clicking on your notes, click the "Copy to clipboard" button so that you may paste your generated code into your AVR editor of choice. Note: the full source is available to whoever is curious inside the jar itself. Just open it up using a compression utility such as Winrar or 7-Zip. I forgot to mention that periods for all the notes on both staffs are predefined, so you don't have to do any converting! I just realized that I did not edit the METAINF of the original link, so the application would not start unless you fixed it. DO NOT DOWNLOAD FROM THE LINK IN THE ORIGINAL POST, USE THIS LINK INSTEAD!!! Neat app, should make building your music files much quicker. Anything that reduces physically typing the code can be helpful. Thanks for sharing it with the group! after the years the link is broken. Did someone of you download this tool and want to share it with me? Sorry, I didn't download it at the time.